Ian Collie and his wife, Claire, moved to Te Anau in 1987. Prior to that, they had farmed in Wilden, West Otago, which was Ian’s family’s base. They were not happy with what happened to agriculture in that era and were ready for a change, as Ian explains. “We bought a tourist shop, selling a wide variety of woollen garments. Having run sheep, I was confident I could sell wool products. However, it soon became apparent that nothing ever stays the same, as the business developed into more of an ‘outdoor adventure’ shop, increasing from 40 to around 200 square metres. “I enjoy developing things and the shop was no exception,” he says. Also in development was the property they bought, two kilometres south of the town centre, on what was then a new lifestyle subdivision. “Establishing the garden was a real pleasure, turning it into our haven. Starting up the shop, we had to put our heads down and bums up to make that work. Away from the shop, creating the garden was our escape. We were in our mid 40s, so fit, young and strong, and able to cope with the glacial moraine rocky soil. Every hole required a crowbar. “Creating the garden from what was a bare paddock and making it into a haven to come home to was a real delight and so satisfying. We were very fortunate,” he says. Extending the house was another project the couple applied themselves to. “At first, we thought of it as a shoebox. It was rectangular, one of the old Landcorp houses. As we added onto it, it became something different. “In the early 90s, we extended the kitchen and living room, and built a barbecue. Then, about 10 years ago, we replaced the small old garage with a much bigger one, with room for two cars and a boat, plus an office, and an extra bedroom and bathroom. A couple of years after that, we put bathrooms in all three bedrooms,” he says. Those bathrooms were ideal for visitors, and Ian and wife, Claire, offered homestays from time to time. “Te Anau is a wonderful wee place. Although it does go quiet in winter, that gives you a chance to recharge your batteries and plan for the next season. Most businesses rely on an eight-month tourist season so if money motivates, you need to go somewhere else. If not, Fiordland is a wonderful place,” he says. Five years ago, they sold the business and, in 2015, Claire died. Taking stock since, Ian has decided to move on. Late last year, he engaged Sandra Macnamara and Jenny King of PGG Wrightson Real Estate, Te Anau, to sell his private, secluded 1.13 hectare property. Jeff and Sue Anderson purchased it. 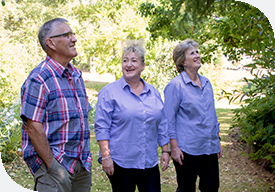 Approaching retirement and with children and grandchildren living locally, they have called Arrowtown home for the past 10 years, though are originally from Mossburn and have planned to move to Te Anau for a couple of years. Seeing Ian’s place offered for sale, they brought forward those plans, will take possession in August and are sizing up the property’s accommodation opportunities. Ian, meanwhile, has bought a section in town and is planning to start again, developing a new house and garden. “It is something I enjoy doing and I’m still fit so I’m looking forward to it,” he says. If you're interested in buying or selling a property in Te Anau, then don't hesitate to contact Sandra Macnamara or Jenny King today!